Glorisbon Hansepi belongs from Karbi Anglong, Assam. She grew up in a big family with four sisters and three brothers. She completed her studies till class twelfth standard but had to discontinue her studies due to the financial constraints in her family. Her father is a farmer and his earning was not sufficient enough to feed the mouth of all the members of the family. She was left with no choice but to quit her studies and dream to stand in her own feet. She simply stayed at home helping her mother in the household chores and could not find any way to earn money for her studies. In desperation her life was becoming hopeless for her. But one fine day while reading “The Arleng Daily” she came across a column of the advertisement by DB Tech – Sojong on the courses offered to the youth like her. Joy found no bound when she realized that it was her second chance to make her dream come true. 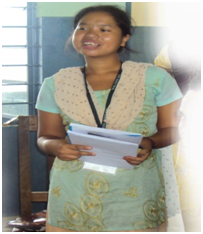 Without any further delay and with the support of her parents she enrolled herself after brief counseling in DB Tech – Sojong in ISMO Domain under SDTT Project. Glorisbon said that, during her training days she learnt to be punctual and patient. She also adds that the course that she selected was the right selection with the talent that God has endowed upon her and also it gave her pleasure to learn and stitch clothes. She is thankful to her trainers who trained her not only ISMO but also computer with lots of games and funs which motivated and encouraged her to pursue her training in the best way. She says, “The great achievement during my training was the knowledge that I earned to become someone and also which gives me hope in time of hopeless.” After completing her course she got her placement in Sahi Export, Bangalore with a monthly salary of Rs.8000/-. She furthermore asserts that, DB Tech had taught her many lessons and led her to the right direction where she could fill the emptiness and hopelessness in her life. “Now I can stand on my own feet and could shape my future because DB Tech had showed me the right path for my life. I will remain thankful to DB Tech for the rest of my life” she adds.